"I think when you get close anyone considers that it's a missed opportunity, however, we were a completely different looking team to the previous two successful years," Shepherd said on 91.3 SportFM. "There's no secret that Fremantle has made 31 changes in three years and that obviously has a knock on effect to us. Some of our great warriors in Bootsma, O'Brien and Leroy all left as well. "With change comes opportunity and we are putting 2018 behind us and we're looking forward to coming back into the five this year." Peel did get strong service last season from Fremantle players like Danyle Pearce, Luke Strnadica, Tom Sheridan, Brady Grey, Cameron Sutcliffe and Michael Johnson who all won't be there in 2019, but Shepherd knows that's just the nature of the beast. He can't control what happens in terms of who is and isn’t available from Fremantle so he doesn't waste too much time worrying about it. It is what it is, but in terms of what he can control, Shepherd wants to ensure the Thunder squad is strong and sustainable on its own with the Dockers players then just the icing on the cake. That's where he sees the recruitment of Jackson Merrett on top of the retention of Ben Howlett, Traye Bennell, Ben Hancock, Blair Bell, Brayden Lawler and Gerald Ugle as crucial to whatever success Peel is to have this year and beyond. "What we can do is work really strongly down here in Mandurah to keep developing our younger players and strengthening our list. We've done that with Jackson Merrett from Essendon last year, we are able to recruit one player and we sought him," he said. "He's been really good in the time he's already been here with his capacity to not only play but educate young players. We think Ben Howlett will be better and we'll look for continued improvement from guys like Hancock, Ugle, Lawler and some of our young guys even some of the ones graduating from colts." While Shepherd has to take a wait and see approach in terms of who he will have available in terms of Fremantle's AFL-listed players throughout the season, what is in his control is the emerging talent at Peel. Shepherd remains buoyant about the next generation of talent coming through at the Thunder and he will be looking at the likes of Keegan Power, Jordan Boullineau, Haydn Matthews, Michael Tassone, James Kirby and Alex Cohen to all take further steps forward in 2019. "We'll look for continued development from Jordan Boullineau who played his first year of league football last year. He played 14 games and I'll expect him to continue to grow," he said. "Then we have a raft of players who have had the taste of league football like Michael Tassone, James Kirby, Haydn Matthews, Keegan Power and there's quite a long list of players who are just starting to build their league careers. "We get them to play with some pretty hardened senior AFL players and other younger ones who are trying to make the grade with Fremantle. "We've been able to bond really strongly previously especially in 2016 and 2017, and last year wasn’t a lost cause. We just fell short at the back end. 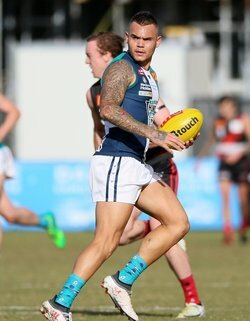 Hopefully Peel will again be one of the sides to beat in 2019." As for the overall state of the competition, there are plenty of unknown questions coming into 2019 with the introduction of the West Coast Eagles reserves team and with East Perth returning to a standalone club once more. It provides for a 10-team competition without the need for a team to have a bye each weekend and with 18 games a season remaining, it means it's a genuine home and away competition with every team playing one another once at home and once on the road. Shepherd is looking forward to all of that and feels that sometimes the unknown can create excitement and be a positive thing. "I reckon it's really exciting the way the competition is looking this year. With change comes a degree of excitement and the unknown," Shepherd said. "West Coast certainly bring an unknown and that means East Perth are a little bit different and they are unknown, and change makes us all pretty excited for the future of the competition. "I think the competition is in a great spot at the moment and the opportunities to play against West Coast with their full alignment and our partial alignment will be really interesting to see how it goes. I think there are a lot of questions that need to be answered but that creates a lot of interest."